I woke up at 6:30, 9:30 and finally got up at 10:15. 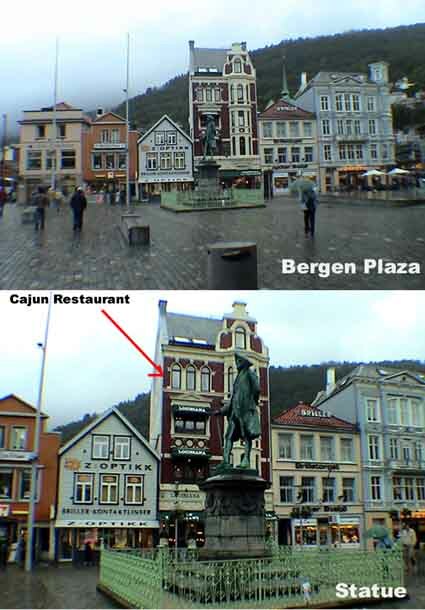 We packed and checked out of the hotel at 11 AM and headed north to Bergen, Norway’ historic second largest city. It was raining and this was the beginning of the rain for us for quite some time. I learned I needed to carry my tiny compact umbrella with me all the time. At 11:15, Marcia drove the 22 miles to Mortavika driving by the battlefield that decided the fate of Norway when Hakon beat all his combatants and unified the Vikings. At 11:30 we had to go through a 3.5 mile long tunnel under the Amoyfjord. It was damp and cool down there and seemed like it was taking forever. 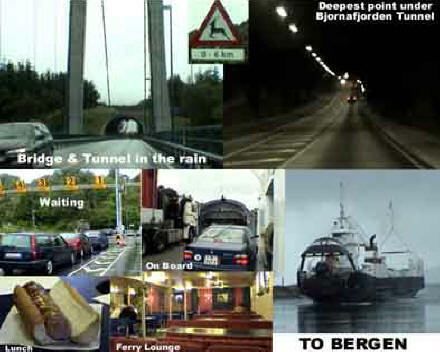 We drove quite a while and at noon we need to take the half hour ferry across the fjord to Arsvågan. 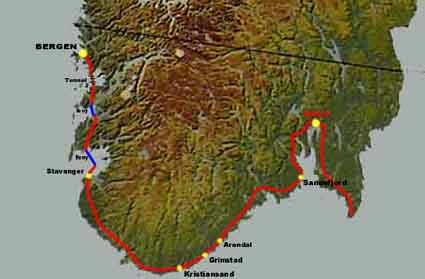 At 12:30, Marcia drove the 70 miles to Sandvikvågan where we had a 5 mile tunnel under the Børnlafjorden. We thought the last one was long; this seemed an eternity. Then a 55 minute ferry to Halhjern. At 3:25 Marcia drove the remaining 115 miles to Bergen and we finally arrived in Norway’s second largest city at 4:15 PM. 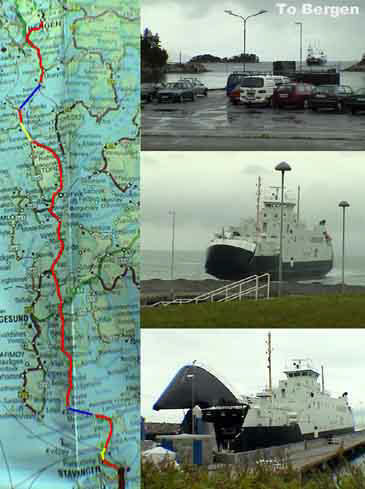 Over 150 miles, two tunnels and two ferries took us 5 hours. 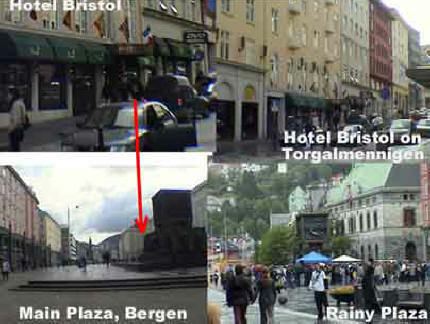 We checked into the Hotel Bristol [Torgalmenningen 11, +47-5-555-1000] and asked what is the best way to see the fjords. 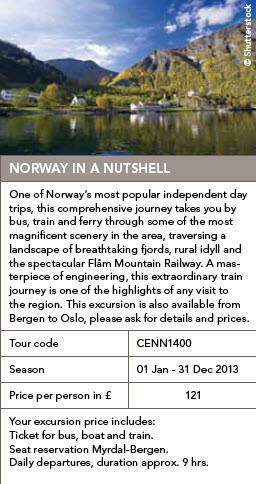 She recommended what is called “Norway in a Nutshell” which I had heard from others was really worthwhile. She told me to book it at the tourist office and told me where it was; two blocks away. Like an idiot I didn’t take my umbrella and after walking for a while I got soaking wet and never found the place. I finally ran in to a 7/11 (which are on every corner here in Norway) and bought one of their umbrellas. Since it was Sunday and I hadn’t run yet, I had two things to get done, but it was now raining pretty hard. So at 5:25 I put on my running rain gear and umbrella and ran to the wharf area and then in the opposite direction up the hill to the big church which I thought was St. Paul’s. When I got there it was closed and I met a young fellow reading the signs who told me that this was St. James, the Protestant church. Turns out he was an Italian from Padua and his name was Giulio Rigo. He was here touring by himself on vacation and looking at churches. He and I then asked people for directions and finally found St. Paul’s on Nygårdsgaten and I was just in time for the 6:00 Mass to begin. Instead of English or Norwegian, this time the Mass was in native Filipino. Who would have ever imagined. A Filipino woman got up to sing in Filipino and it was just beautiful. After Mass I bumped into Giulio again and we discussed the fact that we were both going on the “Nutshell” tour so we would meet again tomorrow. He had been on another fjord cruise and he didn’t feel he really saw enough. I asked him to join us for dinner but he wanted to go to a “real Norwegian” place the bus driver had recommended to him. I walked back to the hotel and changed and Marcia and I headed o ut to dinner. We stopped at the tourist office on the way and booked two tickets for the Nutshell tour for tomorrow. It involves trains, buses and ships but you’re basically on your own and not really in a tour group with a tour guide yakking on and on. We then walked (Marcia using the 7/11 umbrella) across the plaza with the large statue to a place I thought was interesting on my earlier run. 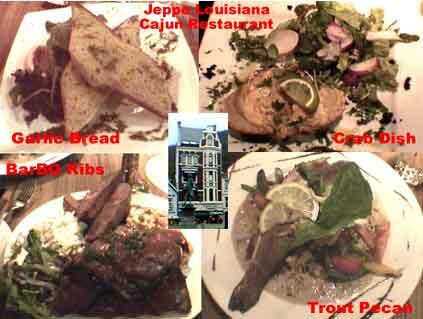 At 9 PM, we took the elevator up two stories to the Jeppe Louisiana Restaurant [, +47-,] a Cajun place right here in Norway. Marcia had a Crab dish followed by trout pecan while I had garlic bread and then barbequed ribs all washed down with Hanse Brygge beer and a bottle of Monteleone Italian vino. It was all very good and filling and they gave us one of their place mats as a souvenir. We walked back to the hotel in the rain and got to bed at 1 AM. I woke up at 7:30 and got up. This is our 26th day, (12th in Scandinavia and 9th in Norway) and one-fourth of the trip is now over. 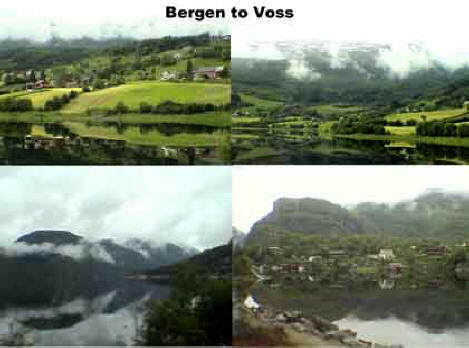 At 8:15 we walked to the Bergen train station and caught the 8:40 fast train directly northeast to city of Voss. The scenery was spectacular with the sun beginning to break through. 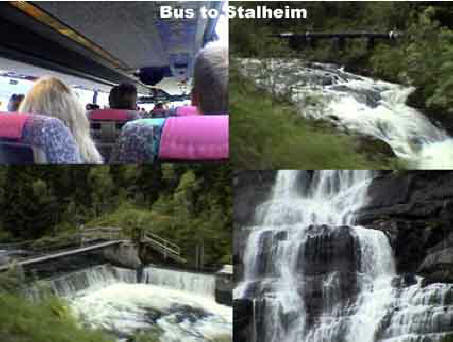 We arrived at 9:55 and at 10 AM we got on a group bus headed north to Stalheim. We never found Giulio since there were about 5 buses. At 10:45 we arrived at the top of this mountain in Stalheim and stopped at Hotel Stalheim so that Marcia could shop and I had a cappuccino. 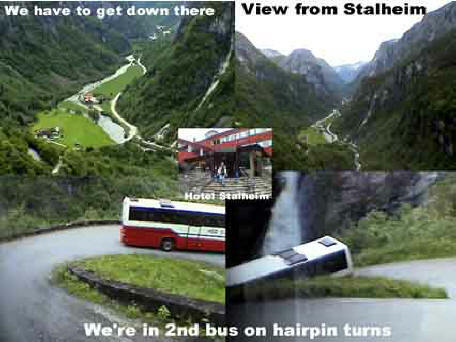 After taking pictures of the spectacular valley below at 11:00 we got back on the bus to take the windy spiral hairpin turn road to Gundvangen at the bottom. Watching the trail of buses make these hairpin turns (above right) was hair-raising. 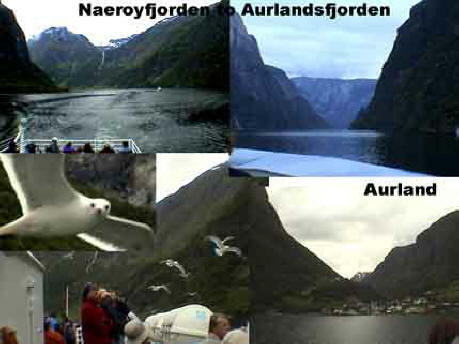 We got there at 11:25 and 5 minutes later we boarded the boat that would take us up the Nærøyfjorden, around the bend, and then south on Aurlandsfjorden to the town of Fløm (with a stop at the town of Aurland.) 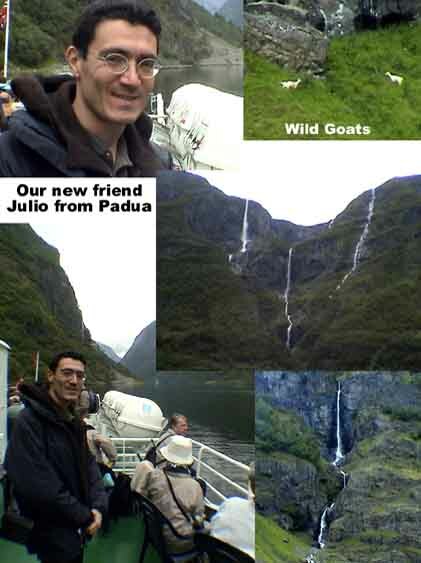 We finally met up with Giulio (below left) while boarding the boat and we spent most of the trip together watching the gigantic waterfalls spilling down the mountains. The gulls that followed the boat were cute in the beginning but after they started dumping on us everybody was screaming at this lady that kept trying to feed them. We arrived in Fløm at 1:30 PM and while the rest shopped and ate I did my run at 2 PM along the shore of the fjord. After I was back, I had a cappuccino with Marcia and Giulio and did a little shopping myself. 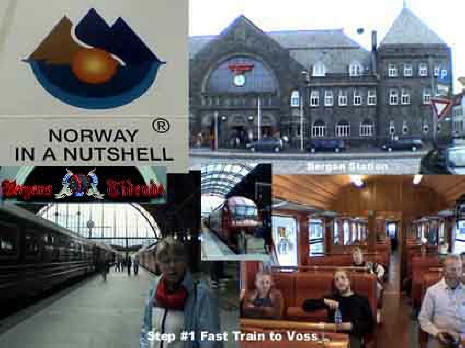 At 2:50 we boarded the Flømsbana train which carries you back up to the top to the town of Myrdal.